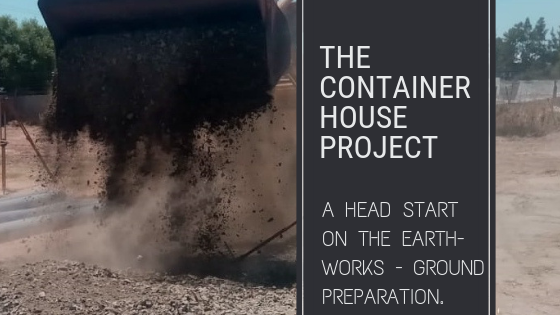 Even though we had extra time over December to work on the Container House Project, we were not able to do as much on the project as we would have liked. The construction industry shuts down in December. We were not able to hire equipment or buy materials. However, just before the holidays began in earnest, we managed to complete a substantial chunk of the ground preparation on the property. Therefore, welcome to our first blog post for 2019! We’re expecting great things to happen this year and should soon be able to show you some photos of our actual house going together. We’re very excited! Our property is in a little valley and rain water from the surrounding plots runs into the centre of our yard, the lowest point, exactly where we are planning on building our house. Therefore, we decided to build up the ground in that area so that our house is not sitting in a giant puddle of water during winter. Ground preparation is quite necessary! In order to make a stable platform on which to build our central courtyard floor we moved some of the topsoil from the sides of the plot to the middle. Over that we added a layer of G5 & G7 sub base and compacted it, in preparation for our new central floor. We had to move several tonnes of top soil and sub base. This would have been extremely difficult to complete with a shovel and wheelbarrow. Therefore we hired a TLB (tractor, loader and backhoe) and operator for a day and a half. Things progressed at a furious pace. Action Shot! Starting on the G5/G7 layer. This is my favourite photo of all the photos taken on this day. Once the layers of top soil and sub base was in place, it all needed to be compacted. Compacting only works for up to 150mm of soil/gravel, so we had to compact after moving the top soil, and then again after moving the sub base into place. If we don’t compact, the ground will settle itself with time, causing hollow spots under the floor. The floor then might dip or crack; something we would obviously like to prevent. Most of the work was completed by Louis and Kevin. The strangest fairground ride ever! The level of the ground is approximately 500mm higher now than it was originally and we now have stable base for the floor of our central courtyard. We’re still thinking about various flooring options for this area of floor, but at least we now have a stable base on which to put it! Previous post: We Bought Building Sand and Stone. Why? Exciting times! I love following your progress and can’t wait to see so much come together for you guys this year! You must be so happy that things are finally happening. It is exciting to see how it is now starting to develop. Fantastic start to the year. PS. I love that action shot. Well Done! Ha ha! I’ll bear that in mind if I ever need a new job – fashion earthworks consultant ?